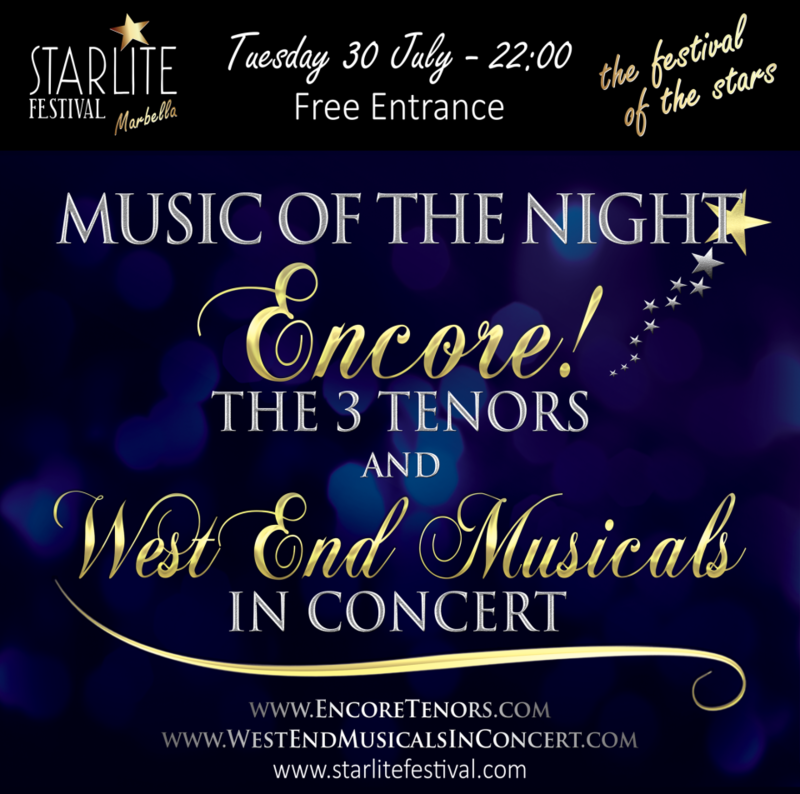 STARLITE FESTIVAL – ‘MUSIC OF THE NIGHT’ with Stephen Lloyd-Morgan, ‘Encore! 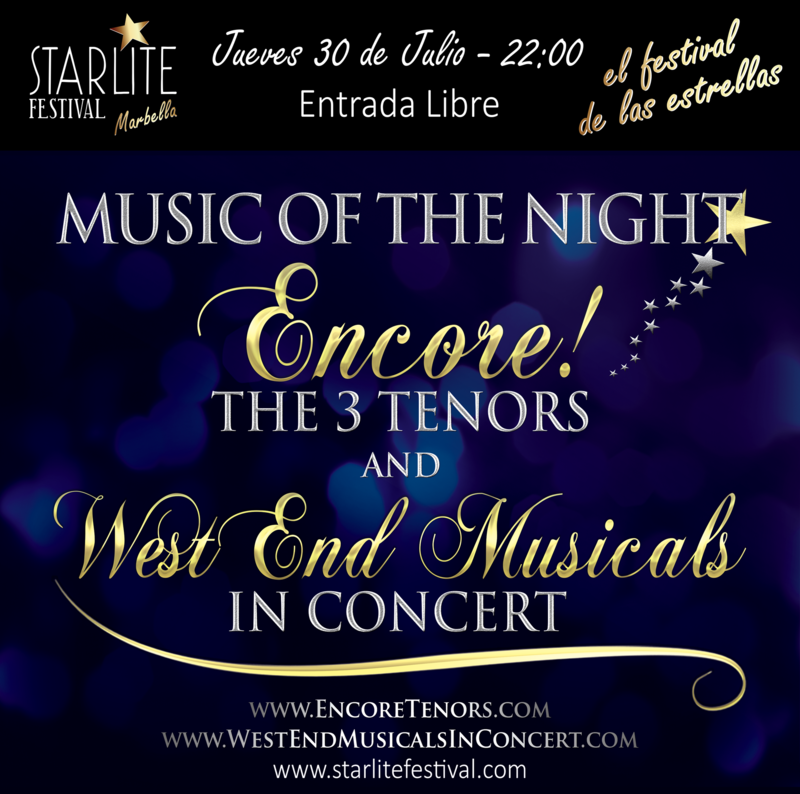 – The 3 Tenors’ and ‘West End Musicals in Concert’ | Marbella Marbella – Adelante! 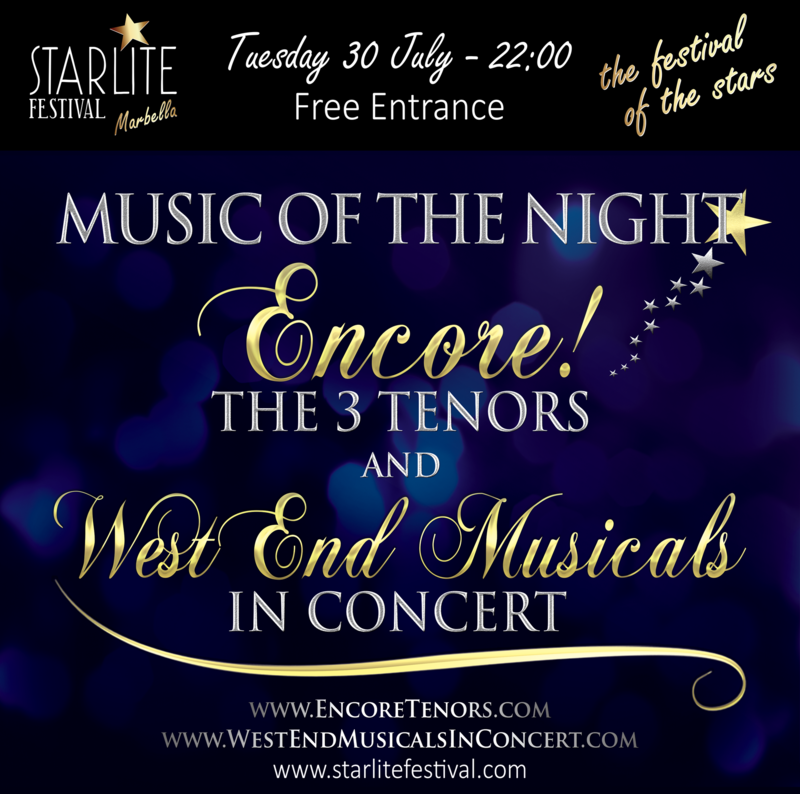 SPECIAL ANNOUNCEMENT – We are delighted and pretty excited to be able to announce that we have accepted an invitation to stage a show at this year’s STARLITE FESTIVAL MARBELLA – www.starlitefestival.com – the show ‘Music of the Night’ on 30 July at 10pm will incorporate the best of the shows of ‘Encore! – The 3 Tenors’ & ‘West End Musicals in Concert’ which will include a section dedicated to ‘Les Misérables’ and the tenors will be joined by special guest soprano Julie-Anne Hunter. For those that didn’t go last year it is an amazing venue for a concert and the best bit is that due to the sponsorship provided for the festival ENTRY for this show on 30 July will be FREE! – also your chance to see the venue in the first week of the month long festival! Tenor Stephen Lloyd-Morgan and the outstanding cast of the popular sell-out shows ‘Encore! – The 3 Tenors’ and ‘West End Musicals in Concert’. Well known and popular classical and musical theatre tenor Stephen Lloyd-Morgan is often referred to as ‘Marbella’s favourite Tenor’ and headlines in this exclusive concert especially created for this year’s Starlite Festival Marbella; entitled ‘Music of the Night’. The concert comprises a combination of two other shows in which Stephen currently appears and co-produces that have been selling out at venues the length of the Costa del Sol for the past 3 months. In the first half of this concert we have ‘Encore! – The 3 Tenors’ where Stephen joins the three other wonderful voices of Spanish tenor Raúl D’Abreu, English tenor Paul Anthony and astounding special guest English soprano Julie-Anne Hunter; and will feature amongst many other songs Granada, La Donna Mobile, Caruso, Funiculi Funicula, O Sole Mio, Besame Mucho, Volare, Somewhere, Ave Maria, O Mio Babbino Caro, Pie Jesu, Brindisi & Nessun Dorma. In the second half of the show ‘West End Musicals in Concert’ Stephen and Paul join with the two other magnificent voices of Adele Lee Peters and Gemma Lloyd. It will comprise highlights and showstoppers from the very best of West End Musical Theatre, including songs from Jesus Christ Superstar, Hair, Evita, Miss Saigon, Wicked, Phantom of the Opera, The Lion King, Joseph, Cats, Oliver & Chicago, and with an entire section dedicated to the multi-award winning show ‘Les Misérables’ to conclude the concert before a finale featuring all 6 singers.